Sales to all three types of energy consumers—residential, commercial and industrial—fell off. What do these poor numbers in the face of a booming economy indicate for the future? Lawrence Berkeley National Labs did an analysis recently of electricity sales growth based on a detailed bottom up approach. Researchers looked at electricity usage (how many refrigerators, changes in light bulbs, etc). The government's Energy Information Administration conducted its own study based more on big picture relationships. Both arrived at the same conclusion. But these projections assume little or no impact on energy sales from ongoing societal efforts with regard to decarbonization. There are two areas with enormous growth potential--transportation (EVs) and increasing reliance on electricity for home heating, as opposed to natural gas or oil presently. Add these two together and those potential new loads could eventually approximate 40 percent of present U.S. electricity sales. But there is always something. No one is quite certain when. Automobile companies seem serious about increasing electrification of ground transportation. But on a volume basis the numbers do not appear meaningful until the early 2020s. Tesla seems serious about it now, but appears to be having difficulties with quality and levels of mass production. As with any technology, the question is always about new, potentially lower cost entrants leapfrogging the competition. In this case, our question is whether lithium-ion batteries are merely a brief sideshow. It is quite possible that global car manufacturers will rapidly transition to alternative, solid state batteries. Potential impacts on prospective energy markets remains highly uncertain. This uncertainty about sales adds a relatively new risk to the electricity business. And may even delay investment in new facilities required for the expansion of the electric vehicle market. This brings us back to point we have made before. Broad societal goals like decarbonization, regardless of the policy or economic merit, typically require governmental guidance and often actual financial subsidy as well. If not, we may be purchasing our EVs from Chinese-owned companies whose government supported the local infrastructure needed to build a market for the manufacturers and allow them to reach scale faster than their European, Japanese and American counterparts. The Chinese government, like most state actors in the utility infrastructure sphere, both western and non-western alike, tend to take a long term, perhaps even multi-generational approach to infrastructure planning. And as a sovereign, currency and debt issuing entity, they don’t have to care about cost of capital or earning a return on investment. 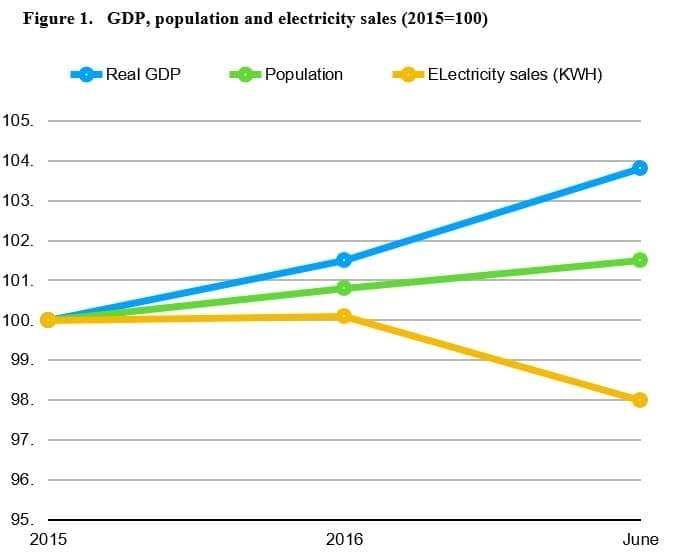 So, back to the electricity sales picture here. At best, it looks flat for some time to come. What this tells me is that we are doing more with less and that will continue. Energy efficiency is here to say and will accelerate. We can do and enjoy more with less. I also wonder how much this is due to Americans adding solar panels to their homes, a trend that will also accelerate as the cost of solar continues to drop rapidly. So we will use less coals, oil, and gas to generate electricity than expect just a month or year ago, and the trend will likely accelerate. Fortunately that will mean we can export more natural gas, and that demands on the domestic and international oil markets will be less. Article after article shows us that there is more oil and gas coming online, that OPEC/Russia have to idle more and more production to keep the price high, and that even growing economies will need less oil and gas to meet their energy needs as efficiency means we can do more with less, and renewables get cheaper and grow market share. I'm hoping that OPEC/Russia can keep idling enough production capacity to keep the price of oil artificially propped up. The industry is providing a lot of jobs in the USA and now is the time to get our oil and gas out of the ground and sold at a decent prices.